Alicia apparently decided to start a new mythology today when handing out some Valentine candy to the kids: Cupid the Valentine Turtle. Alicia: Here’s you valentine’s day candy from… the… valentine’s….. turtle. Jake (looking at mom like she’s an idiot): Turtle? What about Cupid? Alicia: That’s the turtle’s name. 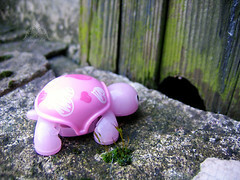 Cupid the Valentine’s Turtle. maybe it’s not a new mythology after all.